That's a perfect photo...both the caption and Gordon's little tongue. I don't know how you do this! Oh Gordie.. bird hunter extraordinaire! I'm just loving the Drapers - I have an old lady tortie cat and a distinguished gentleman orange tabby/white cat, so I'm kind of predisposed to like litters that look like these guys do. How very . . . alarming :) Oh, Gordon, you heartbreaker. Oh noes! Not da' bird! hmm gordon. it probably looks better than it tastes. This is so twisted. I love it. Gordo is certainly a special kitten! Everytime I see this picture I laugh. His forever family will be specially blessed! Perched, and sat, and nothing more!!! Oh what a feerce hunter Sir Gordon is! So adorable - and he has quite a flair for drama that mixes well with Laurie's! Ha! We have the same crow over here, too. Gordon, you are going to be a wonderful provider for the family lucky enough to adopt you! This photo and the one of Perry in the "Be Afraid...Be VERY Afraid" post should be released in a Halloween card set :-) TOO cute! 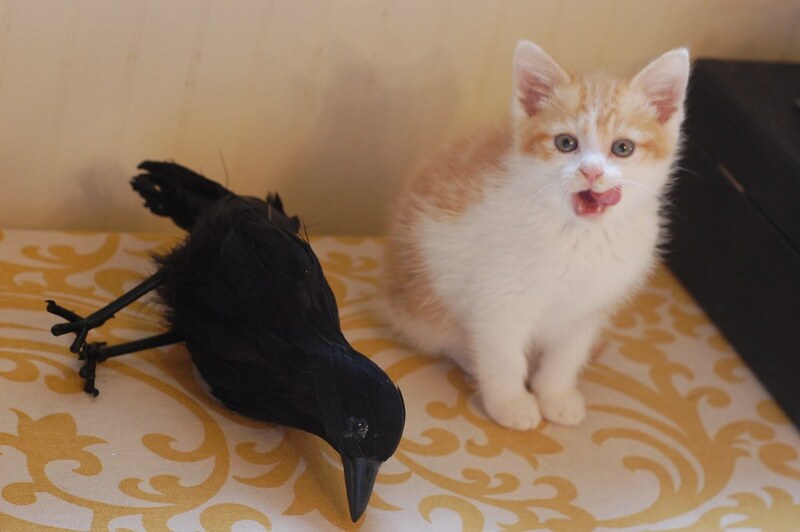 That is one busted kitty - although it could be that he was just defending you from the evil crow. Either way he is too cute!